The liner is longer than the outside teepee fabrics to insulate from draught. Contrary to what everyone could think, the teepee has not been used by Quebec Natives. 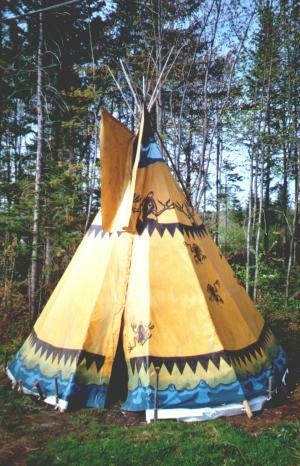 The teepee is indeed a native housing which origins are in the West of Canada and United States. In Quebec, Native people used wigwams, longhouses, innus tents and round wood houses. Passion of the public towards this kind of housing makes that we can now find it in many private and public places. The teepee is a kind of housing that is the nearest of nature and everyone can use it. It can be used as an extra room at a chalet, at a forest camp, as camping, for touristic housing as in Bed & Breakfast, at outfitter establishments or as a meditation place. With its chimney and smoke flaps, you make fire in the teepee with no fear of being smoked. The teepee is then a very nice place to spend time even in winter. During summer, the teepee stays cool inside at the contrary of a camping tent, for example. The Teepee Tseiwei's teepee is made of 17.5 oz white cotton (American Army coton duck) with Excello treatment. It is so treated against water, fire and mildew. The standards against fire are, in the USA : CPAI-84 (section6); in Canada : NFPA-701. The double sewings are made with a polycotton thread (80% polyester and 20% cotton). The polyester resists to the ultraviolet rays and to mildew; the cotton keeps the sewing waterproof. Additional fabric reinforces the teepee at strategic places as at the upper neck, smoke traps, buttonholes bands and all around the basement. Copper eyelets are fixed around the basement's fabric to bend the ropes around the pegs.